The relationships bassist Martin Wind forged with the two disparate groups that perform on his Light Blue reach back decades. 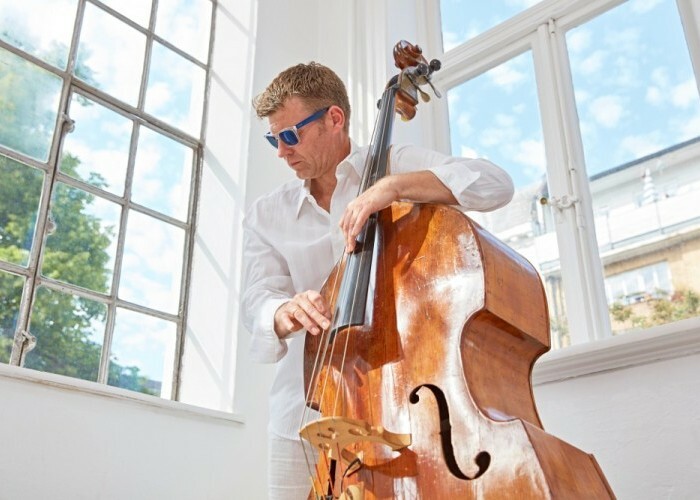 Bassist and composer Martin Wind sees Light Blue (Laika), his newest and 11th disc, as a two-in-one project. That conceit comes across in how he evenly divides the album’s 10 compositions between sides one and two, as if it’s an LP. Side one—Light—features an ensemble that includes trumpeter Ingrid Jensen, saxophonist Scott Robinson, pianist and organist Gary Versace and drummer Matt Wilson. Side two—Blue—showcases Wind leading a different combo that includes drummer Duduka Da Fonseca, pianist Bill Cunliffe, singer Maucha Adnet and clarinetist Anat Cohen. Some musicians overlap between the two sides: For instance, Robinson, on tenor saxophone, plays on “While I’m Still Here,” the strutting opener of Light, and Blue’s opener, “A Genius And A Saint,” an enchanting ballad, on which he delivers a sterling clarinet melody. Cohen crisscrosses between the sides, too. She pairs her ebullient clarinet with Robinson’s saxophone on Light’s prancing “Ten Minute Song,” while participating in all of the five tunes that make up Blue. “I look for players who play my melodies as if they had written them,” he said. The bassist’s strongest ally is Wilson with whom he’s built a fruitful professional and personal relationship that dates back two decades when they played together with the late singer Carla White. Since then, they’ve both played in each other’s ensembles, as well as joined forces as the rhythm section for such stellar musicians as singer and pianist Dena DeRose, pianist Bill Mays and clarinetist Ken Peplowski. Of course, the strongest common denominator between Light and Blue is Wind, who buoys both groups with his sinewy, joyous sound. Wind credits a duo recording of bassist Niels-Henning Ørsted Pedersen and guitarist Philip Catherine that he was introduced to when he was a teenager in Flensburg, Germany, as being the influential bedrock for his extremely melodic approach to the bass. In addition to citing other bass luminaries, such as Ray Brown and Ron Carter as significant touchstones, Wind also credits his melodic approach to the six years of studying classical music during his formal education that began in high school and included time at the Music Conservatory in Cologne, Germany, in the German navy band and at New York University. Wilson praises Wind as a consummate jazz bassist, in full command of both his instrument and imagination. Light Blue offers some of Wind’s fetching compositions, all of which teem with captivating melodies, seductive harmonies and emotional immediacy. As a composer, he often pens music away from the bass or piano in a manner that he learned from pianist Kenny Werner, called “random composition,” while studying at NYU. Fellow bassist and composer John Clayton argued that Wind has great command of ensemble writing, too. Light Blue certainly exudes an abundance of life. Songs like the effervescent, samba-driven “Seven Steps To Rio,” the dark, harmonically rich ballad “February” and the stomping, funky whimsy of “Power Chords” illustrate Wind’s knack for concocting picturesque originals that are at once ethereal and earthy.